Thanks to everyone for an excellent event! Save the date for next year: January 31 & February 1, 2020! Farms are more than the soils and sales that make them up. Farmers are also influenced by their own life events and the cultural context that exists in the field and beyond. 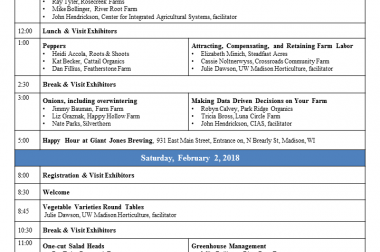 In this session three different farms will dig deep on a specific experience, value, or line of thought and how that has helped to shape their farm practices in unique ways. This conference is a testament to how much farmers have to learn from each other. This session is an opportunity explore not just the technicalities of farming but also the way what we do is influenced by life on and beyond the farm. These sessions will provide detailed production information from variety selection to post-harvest handling enhanced by photos from the field and specific to a variety of scales. 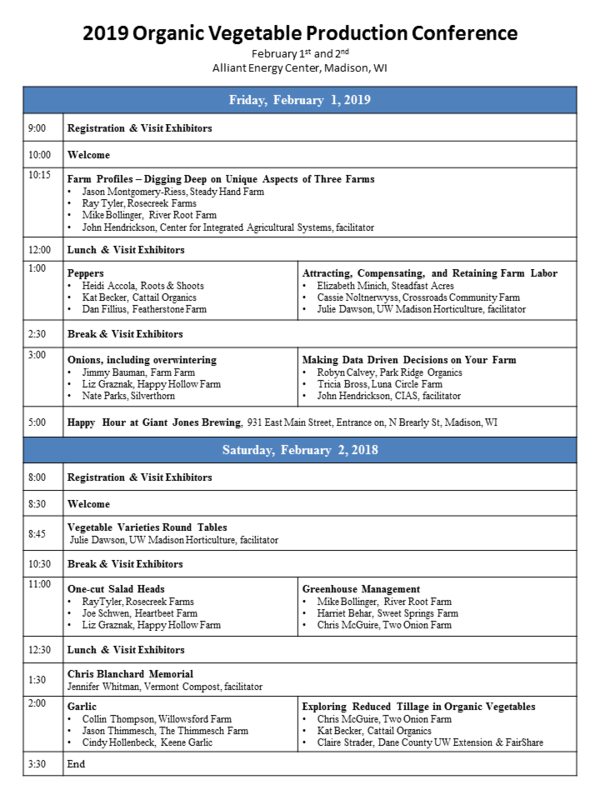 Participants will receive handouts detailing the systems of each of the presenters, including everything from germination techniques to crop spacing, equipment used, disease and pest control, and more. The difficulty of finding and training skilled labor for the farm ebbs and flows from year to year. At a time when it is particularly difficult, this session will address some creative ways of meeting the challenge. From a new Organic Vegetable Farm Manager Apprenticeship that helps farmers attract and train skilled workers, to the J-1 and H-2A Visa programs that can bring foreign workers to your farm, to revamping your employee compensation package, this session will take a broad look at farm labor options. The results of a pre-conference survey on farm employee compensation will also be discussed at this session. Every good business relies on data to make decisions, and farms are no exception. 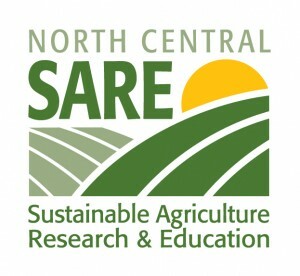 This session will explore how farmers can gather data, record it, and use it to their benefit. The farmer presenters will talk through real life examples of how they have used data to make decisions and what happened next. Excellent varieties are central to successful organic vegetable production, which is what makes this session so popular every year. This year participants will be able to submit their favorite varieties through a pre-conference survey. That information will be compiled and distributed to all participants at the event and will form the base of a deeper discussion on the pros and cons of a wide range of varieties and crops. Chris Blanchard of Purple Pitchfork and the Farmer to Farmer Podcast passed away on October 28, 2018. He was known and loved by many of the farmers at this conference. This is our time to remember him and celebrate the legacy he has left on farms around the world. Jennifer Whitman of Vermont Compost will facilitate this session of stories and memories of Chris. Everyone is welcome to speak. Like the vegetable specific topics, this session will focus on the details of greenhouse management from three different scales and styles. 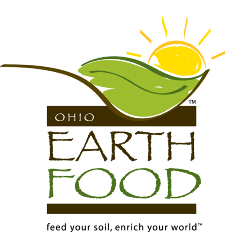 From soil block seedling production for on-farm use to large scale wholesale seedling sales, from a passive solar greenhouse to the more common gas heated hoop, this session will cover a wide variety of greenhouse systems and options. The most common criticism of organic agriculture is that it relies too heavily on tillage. We use it to prep our beds, incorporate residues, kill weeds and more. While tillage has its place, there are many reasons to reduce it and thus reduce and the damage it can do to our soils. These farmers and researchers are exploring reduced-tillage techniques in their fields and hoophouses and will share their successes and frustrations about this cutting edge of organic vegetable production. Clarion Suites – Attached to Alliant Energy Center, 608-284-1234. Identify yourself as part of the “Organic Vegetable Conference Group” for a discounted rate of $109 plus taxes, or reserve your room online through January 7th. Rate includes hot breakfast in the morning and complementary social hour in the evening. Home Stay – Connect with others offering or requesting a homestay in the Madison area on our Facebook Event page.